WATERVILLE (WGME) -- The Colby Mules are back on the road for the NCAA Division III quarterfinals. Balanced scoring, great goaltending lead teams to NCAA quarterfinals. ...The Mules may be riding a wave of postseason magic, but the Knights are drawing from valuable experience on this stage. Geneseo has reached the national semifinals in two of the last five years (2014 and 2016). The run Colby is on is fueled by a lot of factors, including great goaltending from Lawrence, great team defense, and four lines that have been opportunistic in scoring at critical times and in all situations in these “win-or-go-home” games. GOAL!!!!! 2 seconds left and Justin Grillo scores for Colby!! Mules win! Colby in Frozen Four next weekend in Lake Placid. The first Miracle on Ice happened at Lake Placid in 1980. The Mules get their miracle goal to get to Lake Placid. Freshman Grillo's late goal sends Mules to Lake Placid for Frozen Four. ...“What do we need to do to re-establish our game in overtime, that’s what I was thinking,” he said. His players, however, had other ideas — like making sure overtime wasn’t necessary — as they attacked up the ice one last time in the period. Freshman winger Justin Grillo gained control of Thomas Stahlhuth’s deflected shot in the high slot and fired it past Knights goalie Devin McDonald with a mere 1.6 seconds remaining to give Colby a shocking 2-1 victory. Grillo's heroics have Mules headed to Frozen Four in Lake Placid this week. Senior netminder Sean Lawrence, who made 17 saves in the third period alone against Geneseo to give Colby hope, has gone 7-0-2 between the pipes in his last nine starts to mirror the team’s current unbeaten stretch. The Mules have beaten teams ranked in the nation’s top seven in each of their last three games. WATERVILLE, MAINE (WABI) - Colby men's hockey is heading to the Frozen Four this weekend in Lake Placid, New York. 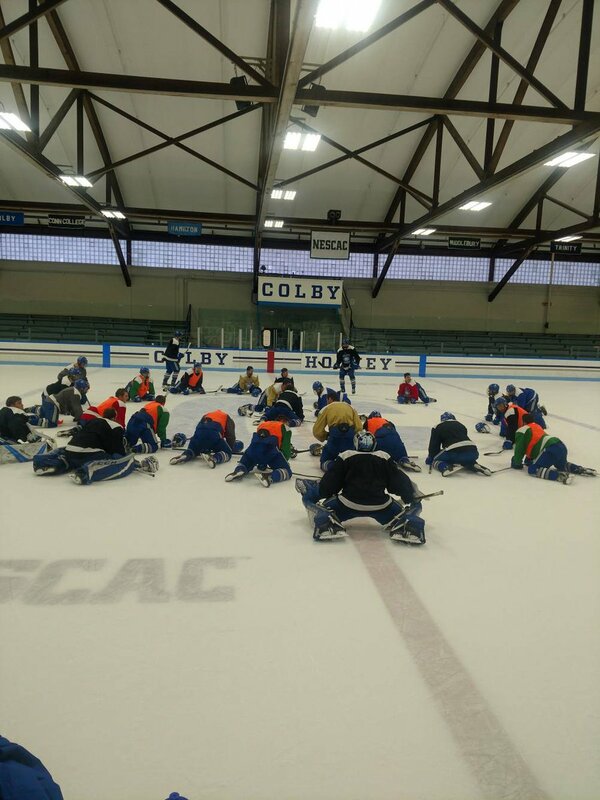 The Mules held their final practice at Alfond Arena, in Waterville, this afternoon.